Well it's official, I'm in the 180's! I'm not totally excited about it yet because I've been fluctuating a lot, so I would prefer to be like 187 before I'm 100% confident of saying "I'm in the 180's". I know that sounds nuts, but my weight has fluctuated pretty wildly this week so I'm just being realistic. I think my muscles are in a state of WTF and retaining water or whatever muscles do, lol. Anyway, I'm very happy with that number and feel that I'm continuing to do the right things, so basically I'm just going to keep on keeping on. 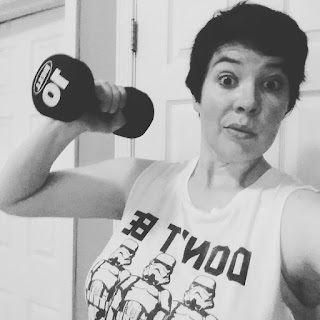 Yesterday in honor of May the 4th the Lovely Ladies group put together a Star Wars workout challenge. You could choose to be on the Rebel team or the Dark Side team, and each one had a different set of exercises to complete. There were also extra credit run/walks that everyone could do. Eric and I of course picked the Dark Side, so we had to do 15 crunches, a 30 second plank, 30 seconds of toe taps, 5 donkey kicks per leg and 5 minutes of marching in place. We also squeezed in an extra credit Nerd Herder Mile at work! It was a lot of fun and I think will be a new tradition for us! My first week of my FB Fit program is almost over and I am liking it so far and already noticing changes in my body. The only buyer's remorse I have is that I wish I'd gone with the FB30 program instead where each video is 30 minutes or less. I do my workout every day when we come home from work, then go down and make dinner. It's been really challenging to workout for 45-60 minutes, then have to rush down and put together dinner in 30 minutes, so I just wish I had a little extra wiggle room. I'm usually famished by the time I put dinner on the table, which is also isn't ideal. Eric can totally fend for himself and it's not like he's cracking the whip about dinner, but I like cooking him (and me) homemade meals since they are healthier and I get leftovers out of the deal. Anyway, being done in 30 minutes would just make like a little less hectic but, it's all good. I also wish they had two rest days a week instead of just one. I just feel a lot of fatigue in my muscles and it would be nice to have one more recovery day. There's no pain or unpleasantness, just a sense of being a bit tired and maybe not having as much "get up and go" as they say. It's telling that I practically threw confetti in the air when I saw today's workout was just a 30 minute yoga stretching routine! Tomorrow is a rest day and I will definitely be resting! I know I could take an extra rest day on my own if I really need it, but I'd like to not get off the schedule too much if I can help it. I know that sounds like a lot of complaining, but I do like the program a lot! They do a great job of having a different muscle group being worked each day, which is exactly the kind of guiding I needed since I tend to just focus on my lower body. I have never ever challenged myself this much when it comes to strength and cardio workouts, and I'm finding that I actually like lifting a lot! I'm still weak AF compared to most people I'm sure, but I'm able to use the 10 pound weights for a lot of the exercises. 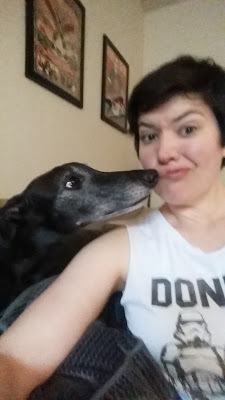 I just needed to throw in this shot of Molly, who is always determined that she needs to touch her mouth to mine. Considering she munches on her nether regions all damn day, I do not share this desire with her. I'm so glad you do like this program! Sounds like it's really working well for you too! Ollie does that too and always wants kissies after. ugh. Chris and I joke that he must have the cleanest boy bits ever but then can turn around on a dime and roll around in a mud puddle. sigh. Wonderful loss too! It's still thrilling getting in a new decade though! WOO HOO to the loss!!! Then your dinner is ready whenever you are! GEt it, girl! I definitely need this kind of structured plan to get serious about weight training. It's always a "going to do it one day" thing, which means it's a "rarely" thing and when I do work out, it tends to be the same exercises over and over.